MONTREAL and TORONTO (CANADA), October 27, 2014: The board of Champion Iron Limited (ASX: CIA, TSX: CIA)(“Champion” or the “Company”) is pleased to announce the initial Australasian Joint Ore Reserves Committee (JORC) Resource and Reserve Statement for its wholly owned subsidiary Champion Iron Mines Limited’s flagship Consolidated Fire Lake North Project in the Labrador Trough, Québec, Canada (see Diagram 1 below). A JORC compliant resource of over 1.2 billion tonnes (Bt), including 755 million tonnes (Mt) of Measured and Indicated metallurgically coarse grained hematite mineralisation for Consolidated Fire Lake North has been estimated. The successful spring 2014 drilling campaign data has been combined with data from the previous resource estimate reported under the Canadian National Instrument 43-101 (“NI 43-101”) to produce this JORC estimate. The current Mineral Resource Estimate was calculated by P&E Mining Consultants Ltd. (“P&E”) of Brampton, Ontario using the Canadian Institute of Mining, Metallurgy and Petroleum (CIM) Standards on Mineral Resources and Reserves and Definitions and Guidelines prepared by the CIM Standing Committee on Reserve Definitions. Mineral resources, which are not mineral reserves, do not have demonstrated economic viability. The mineral resource estimate may be materially affected by environmental, permitting, legal, title, taxation, socio-political, marketing, or other relevant issues. In addition, the quantity and grade of estimated Inferred Resources reported herein are uncertain and there has been insufficient exploration to categorize them as an Indicated or Measured Resource. Furthermore, it is uncertain whether further exploration will result in reclassification of Inferred Mineral Resources to the Indicated or Measured resource categories. The tonnage numbers are rounded according to NI 43-101 standards. Further to the Resource Statement, Champion is also announcing the first Reserve Statement for the Consolidated Fire Lake North Project to comply with JORC. The JORC Reserve estimate totals approximately 464Mt of reserves with an estimated 23Mt, in the Proved category. The board is pleased to advise that this JORC Reserve estimate is the same as the estimate found in the Prefeasibility Study reported under the Canadian National Instrument 43-101. Champion’s Chairman and CEO, Mr Michael O’Keeffe said the completion of work required for Champion to publish an inaugural JORC compliant resource of over 1.2Bt for Consolidated Fire Lake North, and the consistency of this information with the previously published NI 43-101 for the project, is an important development for the Company. “At a time when we are attracting the interest of industrial and strategic investor groups, it is reassuring to have confirmation of the quality of our major asset and increased confidence in its potential,” Mr O’Keeffe said. A new Reserve estimate will be calculated using the resource data found in today’s announcement and will be used to underpin the Feasibility Study currently underway at Consolidated Fire Lake North. 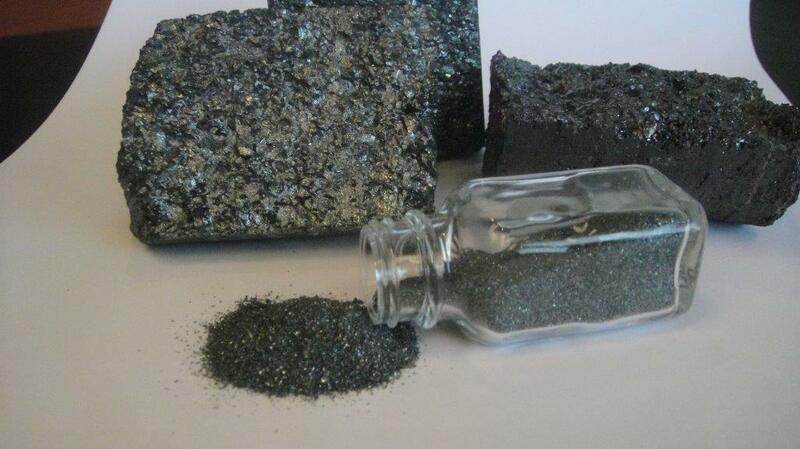 The current reserve is expected to provide approximately 20 years feed to a beneficiation plant where between 9Mt and 10Mt of high grade metallurgically coarse hematite concentrate product aimed at the sinter market will be produced. The new Resource estimate coincides with the recent province of Québec government announcement stating their ongoing commitment to reviewing options for the potential construction of a multi-user integrated rail system. In June, the Québec government advised it would set aside up to C$20 million from its Plan Nord Fund for a Feasibility Study to determine the optimum rail option of a new rail link for iron ore miners in the Labrador Trough. 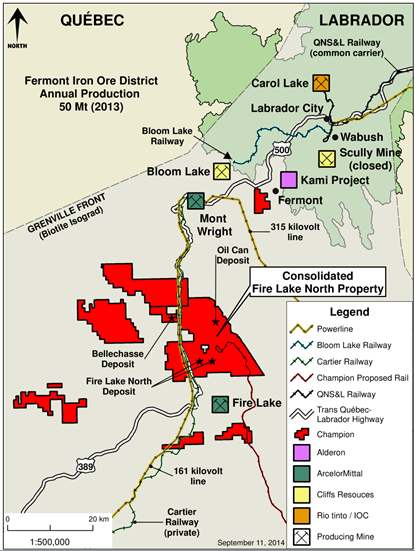 Champion is well advanced on all other aspects of the Consolidated Fire Lake North Feasibility Study and anticipates releasing the comprehensive report shortly after the above rail data are made publicly available by the government, allowing for the incorporation by Champion of the rail operating costs and related data. The focus of the board and management remains on completing a full Feasibility Study for the development of a long-life, low-cost operation at Consolidated Fire Lake North yielding 9.3Mtpa of concentrate at 66% Fe which is expected to command a premium in global markets. The technical information in this press release was prepared and reviewed by Ms. Tracy Armstrong, P. Geo. (OGQ) and Mr. Antoine Yassa, P. Geo. (OGQ) each an independent consultant contracted by P&E Mining Consultants Inc. and Mr. Patrice Live Ing. (OIQ) of BBA Inc.